Attractive vintage home décor can be difficult to find, which makes the Vintage Cast Iron Cat Door Stop Wedge by Comfify a true treasure. Gorgeous kitten design sums up everything we love about our little furry friends, and the design incorporates a gently angled wedge for a versatile fit, and sturdy weight to help keep any door open. Your floor is protected from scratches and scuffs by the padded felt anti-scratch bottom - most door stops don't have a protective bottom and will destroy your floor, check before you buy! The authentic vintage look of this finely detailed kitty door stop is part of the appeal. It's made from recycled cast iron and finished in an attractive antique coating that not only protects from tarnishing, but adds to the look and feel of this door wedge. Artistic design and attention to detail have made this item a home décor best seller! 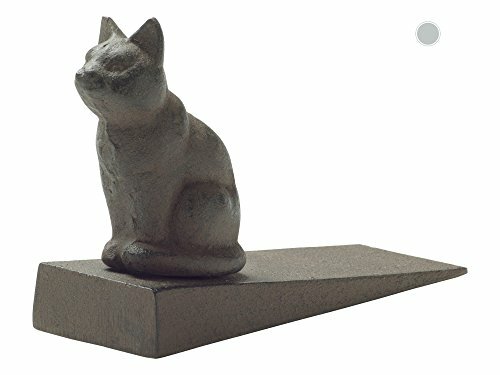 The Vintage Cast Iron Cat Door Stop Wedge by Comfify makes a wonderful gift item for anyone who appreciates nature or simply wants to add to their home a vintage décor item with antique appeal. This little cat is adorable and makes a lovely birthday gift, Christmas gift, or present for any special occasion - it's especially appropriate for anyone who enjoys cats, kittens or simply cute functional decor. CLICK NOW TO ORDER and add this decorative cat door stop to your home! Includes Amazon A-to-z Guarantee purchase protection, and Amazon Prime members receive FREE 2-day shipping. PURCHASE NOW to give this as a lovely gift.